I've written about Olio previously. 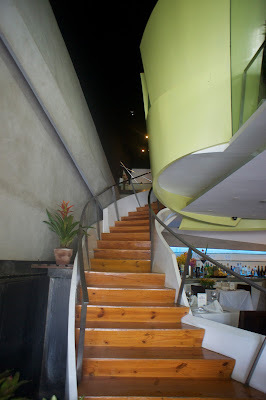 It's a great Italian restaurant in Cebu. Today I write about a peculiar washroom that I've only seen in Olio. I think it's a great design however - I think it should come with instructions since it took me some time before I figured out how to use it. Restrooms are located upstairs. You would have to up this curved/spiral staircase. Upon landing at the second floor - you will see this and if you're like me, you would think that it's art work. Only upon closer inspection would you realize that it's the wash area. It's a beautiful design - but as I said earlier - it should come with a user manual. It took me a while to find a pedal at the foot of this contraption that works like the drinking fountain pedals. Step on it and water comes out. You'll see that you can actually see part of the kitchen downstairs because the wash area is made of frosted glass.